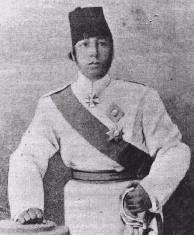 Abdelaziz of Morocco (24 February 1878 – 10 June 1943; Arabic: عبد العزيز الرابع‎‎), also known as Mulai Abd al-Aziz IV, served as the Sultan of Morocco from 1894 at the age of sixteen until he was deposed in 1908. He succeeded his father Hassan I of Morocco. He was a member of the Alaouite dynasty. By the action of Ba Ahmad bin Musa, the Chamberlain of El Hasan, Abd el-Aziz's accession to the sultanate was ensured with little fighting. Ba Ahmad became regent and for six years showed himself a capable ruler. There were strong rumors that he was poisoned. On his death in 1900 the regency ended, and Abd al-Aziz took the reins of government into his own hands and chose an Arab from the south, El Menebhi as his chief adviser. Urged by his Georgian or Circassian mother, the sultan sought advice and counsel from Europe and endeavored to act on it, but advice not motivated by a conflict of interest was difficult to obtain, and in spite of the unquestionable desire of the young ruler to do the best for the country, wild extravagance both in action and expenditure resulted, leaving the sultan with depleted exchequer and the confidence of his people impaired. His intimacy with foreigners and his imitation of their ways were sufficient to rouse strong popular oppostion and create dissatisfaction. His attempt to reorganize the finances by the systematic levy of taxes was hailed with delight, but the government was not strong enough to carry the measures through, and the money which should have been used to pay the taxes was employed to purchase firearms instead. And so the benign intentions of Mulai Abd el-Aziz were interpreted as weakness, and Europeans were accused of having spoiled the sultan and of being desirous of spoiling the country. When British engineers were employed to survey the route for a railway between Meknes and Fez, this was reported as indicating an absolute sale of the country. The strong opposition of the people was aroused, and a revolt broke out near the Algerian frontier. Such was the condition of things when the news of the Anglo-French Agreement of 1904 came as a blow to Abd-el-Aziz, who had relied on England for support and protection against the inroads of France. See also the Ion Perdicaris affair. On the advice of Germany he proposed the assembly of an international conference at Algeciras in 1906 to consult upon methods of reform, the sultan's desire being to ensure a condition of affairs which would leave foreigners with no excuse for interference in the control of the country, and would promote its welfare, which Abd-el-Aziz had earnestly desired from his accession to power. The sultan gave his adherence to the Act of the Algeciras Conference, but the state of anarchy into which Morocco fell during the latter half of 1906 and the beginning of 1907 showed that the young ruler lacked strength sufficient to make his will respected by his turbulent subjects. 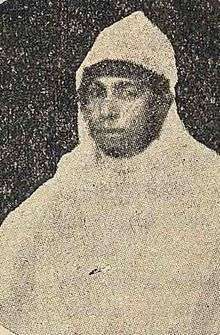 In May 1907 the southern aristocrats, led by the head of the Glaoua tribe Si Elmadani El Glaoui, invited Abdelhafid, an elder brother of Abd el-Aziz, and viceroy at Marrakech, to become sultan, and in the following August Abdelhafid was proclaimed sovereign there with all the usual formalities. In the meantime the murder of Europeans at Casablanca had led to the occupation of that port by France. In September Abd-el-Aziz arrived at Rabat from Fez and endeavored to secure the support of the European powers against his brother. From France he accepted the grand cordon of the Legion of Honour, and was later enabled to negotiate a loan. This was seen as leaning to Christianity and aroused further opposition to his rule, and in January 1908 he was declared deposed by the ulema of Fez, who offered the throne to Hafid. After months of inactivity Abd-el-Aziz made an effort to restore his authority, and quitting Rabat in July he marched on Marrakech. His force, largely owing to treachery, was completely overthrown on August 19 when near that city, and Abd-el-Aziz fled to Settat within the French lines around Casablanca. In November he came to terms with his brother, and thereafter took up his residence in Tangier as a pensioner of the new sultan. However the exercise of Moroccan law and order continued to deteriorate under Abdelhafid, leading to the humiliating Treaty of Fez in 1912, in which European nations assumed many responsibilities for the sultanate, which was divided in three zones of influence. King Abdulaziz led a very active social, but semi-political life in his exile. During the Spanish annexation of Tangier in 1940, he acquiesced insofar as the Moroccan palace authorities called the "makhzen" played a significant role therein. Abdulaziz died in Tangier in 1943. After the ex-sultan's sudden death in 1943, his body was transferred to French Morocco as desired by the Sultan Mohammed V.
He was portrayed by Marc Zuber in the film The Wind and the Lion (1975)- a fictional version of Ion Perdicaris affair. 1 2 3 "Abd al-Aziz". Encyclopedia Britannica. I: A-Ak - Bayes (15th ed.). Chicago, IL: Encyclopedia Britannica, Inc. 2010. p. 14. ISBN 978-1-59339-837-8. ↑ There is a dispute on the exact date of birth with two dates given: Feb 24, 1878 or Feb 18, 1881, while Chisholm (1911) states 1880. 1 2 3 4 5 6 7 8 One or more of the preceding sentences incorporates text from a publication now in the public domain: Chisholm, Hugh, ed. (1911). 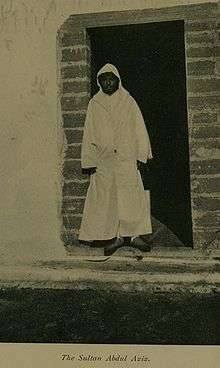 "Abd-el-Aziz IV". Encyclopædia Britannica. 1 (11th ed.). Cambridge University Press. p. 32. ↑ The London Gazette: no. 27329. p. 4399. 2 July 1901.